Dr. N. Scott Ferguson, Optometrist makes it easier for you to take care of your eyes. We start with complete eye exams to determine their health and to identify any problems. We work closely with surgeons in Maine and New Hampshire to provide co-managed care for pre- and post-op eye cataract and laser surgery. Call us at (207) 935-3307 to schedule an appointment. Prevent vision problems with eye exams and pre-op and post-op eye care from our doctor in Fryeburg, Maine. At the office of Dr. N. Scott Ferguson, Optometrist, you receive whatever is necessary to achieve better eye health. We provide a comprehensive examination of the eye and associated structures in addition to refraction services. Your exam includes testing to help us determine the optical power necessary for glasses and contact lenses. We also look for conditions such as cataracts, glaucoma, and any other eye diseases. Treatment of acute injuries to the eye, infections, or eye emergencies is also performed. At the office of Dr. N. Scott Ferguson, Optometrist, we co-manage cataract and laser surgery patients to ensure they receive the highest quality care. This includes making referrals to the best specialist available. We work closely with them to provide pre-op and post-op care. For patients that live in rural areas, this is especially beneficial because it prevents them from having to travel far for follow-up care. Dr. N. Scott Ferguson, Optometrist provides comprehensive contact lens fitting for patients with nearsightedness, farsightedness, astigmatism and presbyopia. We also have specialty custom contact lenses for people with certain corneal diseases such as high astigmatism or Keratoconus. Learn the proper way to insert and remove your lenses with our comprehensive contact lens training. Our technicians show you the proper procedures and how to care for your lenses. We even provide you with a trial kit along with free contact lenses. 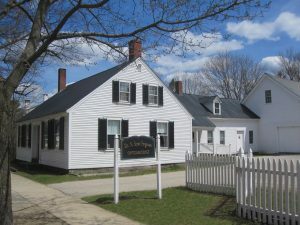 Contact our family optometrist in Fryeburg, Maine, for comprehensive care at one convenient location.